In Khari Baoli, Pakodimal doodhwala used to sell excellent burfiwali lassi, which had a piece of burfi mixed in the yoghurt. His Mathura style lassi tastes similar in which the sweetness doesn’t come from added sugar but from the burfi. After he passed away a few years ago, I could not come across a better burfiwali lassi elsewhere in Delhi. 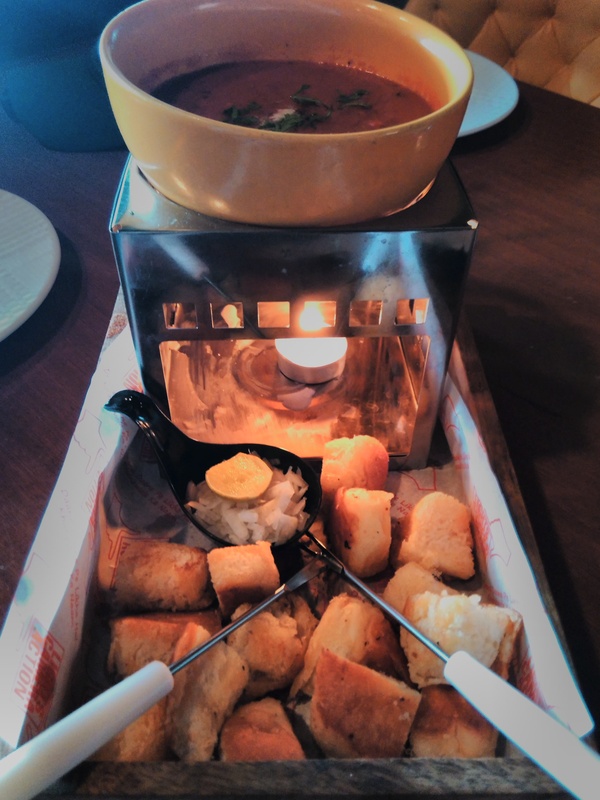 The other day, I went to Lights Camera Action (LCA), a new restaurant situated at B.K. Dutt Market in Rajouri Garden. I was extremely delighted to have been served the creamy, saffron colored, Mathura style burfiwali lassi. Although named Benarsi lassi sphere, it was flavored with the right amounts of kesar (saffron) and pista (pistachio) that simply burst in to the mouth tantalizing the senses and reminding me of UP. The lassi sphere which is served complimentary, reminded me of Pakodimal burfiwali’s lassi. As the restaurant’s theme is Bollywood, the next complimentary dish that arrived on our tripod table was flavored popcorn (an intrinsic part of the movie watching experience). On the recommendation of Mr. Varun Puri, who is the proud owner of this restaurant, my food journey started with Rajnikant’s Early Morning Tea – a piping hot and spicy rasam. The presentation of the dish was quite engaging. 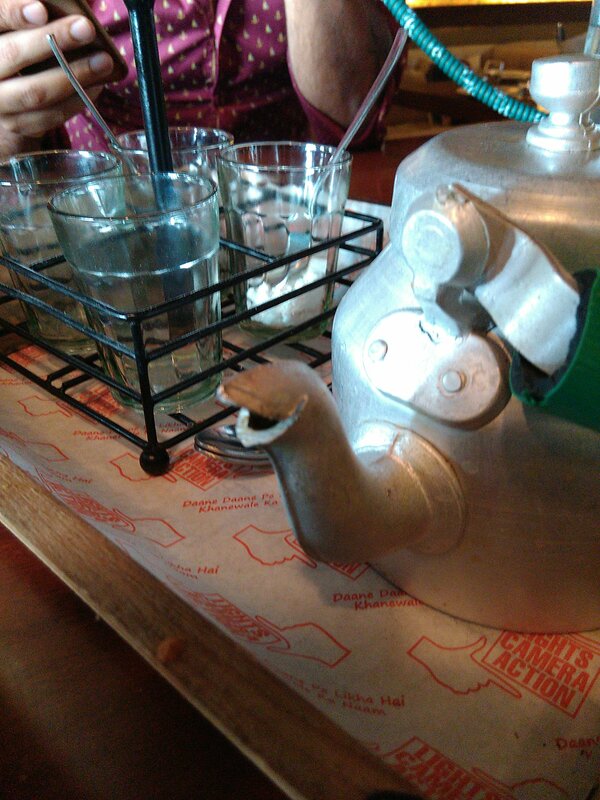 The chai was served in a local dhaba style tea kettle with four glasses containing different ingredients – curry leaves as a substitute to tea leaves and coconut powder as a substitute to milk powder. The crushed curry leaves were added to the glass with coconut powder which formed oil on the sides. I enjoyed the preparation to the core. The names of the dishes at LCA are quirky and interesting. Some of them are – “Main to tere pyaaz mein deewana ho gaya” (fried onion rings dusted with south Indian spices),“Bruceliii ki Broccoliii” (Broccoli marinated in Indian spices and cooked on charcoal), and some street delicacies – “sadak chaap momos” to combo meals – “Dhoodh ka dhoodh paani ka paneer” (A paneer dish with dal, breads and salad). These days street food with a slight modern twist is becoming quite popular amongst restaurants and some of the food writers have explained this as the ‘café-isation’ of street food. At LCA, papdi dhokla chaat is served with a twist, named Hollywood Nitrogen Papdi Dhokla Chaat, it is a real treat to the eyes, as the presentation and serving is done right in front of the guests. Chef Arnav Puri makes the chaat by explaining every step patiently. The yoghurt and dhokla is frozen at -176 degrees using liquid nitrogen. The frozen crumbs of yoghurt is mixed with papdi, tamarind chutney, palak ka patta (spinach leaves), chopped boiled potato cubes then garnished with pomegranate seeds. 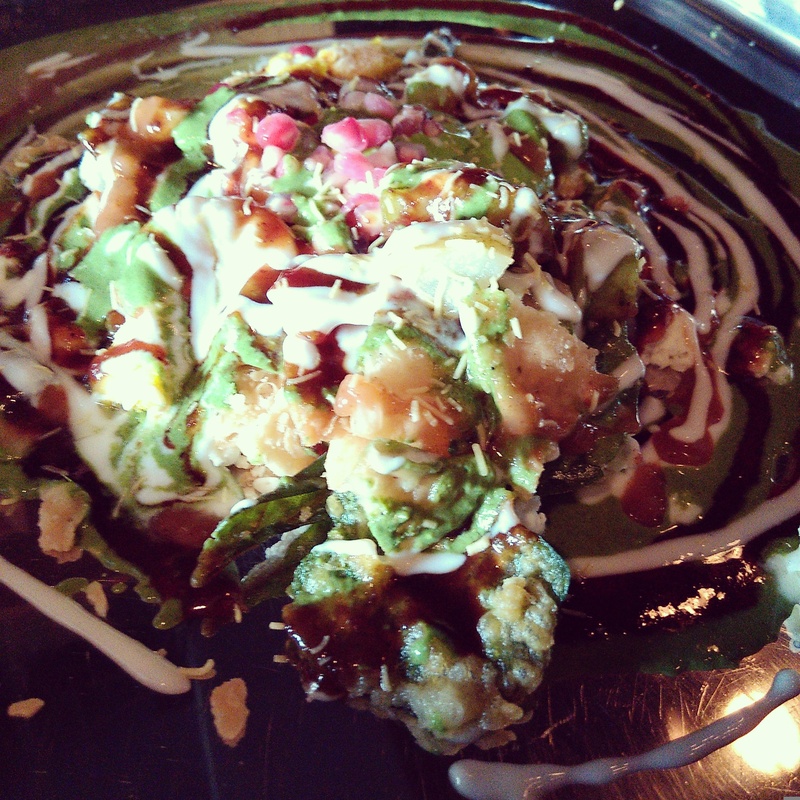 At the top of it all, the frozen dhokla is crushed and mixed well in to the chaat. It was delightful to watch Chef Arnav in action! The other dishes worth trying are – “Chammak Challo” which was an orange leafy salad with zesty dressings,“Pyaar tune Quesadillas” which is tortilla bread stuffed with cheese and sautéed vegetables in Kohlapuri spices and “Jhakaas Maska Pav bhaji” which is bhaji fondue with butter toasted pav. The food journey which started with a molecular lassi sphere ended with a Social Media Coffee shake served in a ceramic glass with the logos of Facebook and Whatsapp imprinted on it.